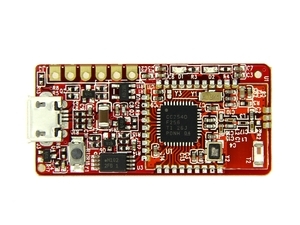 Bluetooth Low Energy (BLE) transceiver board. BLE is a new protocol introduced in the 4.0 revision of the Bluetooth standard. It is a wireless personal area network (PAN) technology aimed at novel applications in the healthcare, fitness, security, and home entertainment industries. BLE is not backward-compatible with the previous Bluetooth protocol. However it uses the same 2.4 GHz frequency bands but a simpler modulation scheme. The picture below shows the RedBearLab BLE Mini Board. The module is a combo of a RBT01 BLE module featuring the Ti CC2540 Single chip Bluetooth (SoC) and a breakout board that offers a micro USB connector and a 3.3Volt UART connectors. The main reason this board caught my attention is the fact that it also has solder points for additional GPIOs on the back of the board. These GPIOs can be custom programed. So it should be possible to hook up I2C or SPI sensors to the board and with a bit of software be able to monitor them. Using such a BLE board is not exactly an IoT solution as the connectivity to the cloud would have to be implemented with for example a Wireless enhanced Gallileo. Also the BLE’s range is rather limited. However when it comes to power consumption BLE has a leg up as it was specifically designed for very low power.